We’d love your help. 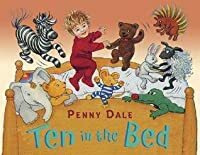 Let us know what’s wrong with this preview of Ten In The Bed by Penny Dale. To ask other readers questions about Ten In The Bed, please sign up. A familiar rhyme where the ‘little one says roll over’. The little one in this version shares the bed with nine cuddly toys. As each cuddly toy falls out the bed, they join in in getting up to all sorts of mischief throughout the house. This is done through illustrations as the words of the book simply recite the rhyme. It does end slightly different to the classic version in that the ‘little one’ is a little bit cold without the other nine so they all jump back into bed to go to sleep. This ver A familiar rhyme where the ‘little one says roll over’. The little one in this version shares the bed with nine cuddly toys. As each cuddly toy falls out the bed, they join in in getting up to all sorts of mischief throughout the house. This is done through illustrations as the words of the book simply recite the rhyme. It does end slightly different to the classic version in that the ‘little one’ is a little bit cold without the other nine so they all jump back into bed to go to sleep. This version is illustrated with lovely detail and would be a great support to counting back numbers in the EYFS. Also great for early readers. You can’t beat the tried and tested classics! Obviously, one to be read whilst snuggled up in bed. The words are easily learned and followed, but it's the illustrations which really make this such a magical book. Lots of expression, emotion and little things going on in the corners and edges to find and talk about. We haven't kept all of the children's early-years books, but this one has a treasured place on our bookshelves and in our hearts. A delightful tale that is easy for kids to follow. Het is een leuk kinderboek om voor te lezen aan kleuters. Het is niet echt een heel diep gaant verhaal en het is ook niet heel origineel. Er bestaan al een hele hoop verhalen en liedjes met precies dezelfde context. Dat neemt niet weg dat het een leuk boek is, de illustratie's zijn leuk en daarnaast ook nog uitdagend tot vragen. Want als er een paar dieren uit bed zijn gevallen dan gaan hun naar de keuken om koekjes en melk te pakken. Dit is iets waar je met je klas op in zou kunnen gaan. Eerst Het is een leuk kinderboek om voor te lezen aan kleuters. Het is niet echt een heel diep gaant verhaal en het is ook niet heel origineel. Er bestaan al een hele hoop verhalen en liedjes met precies dezelfde context. Dat neemt niet weg dat het een leuk boek is, de illustratie's zijn leuk en daarnaast ook nog uitdagend tot vragen. Want als er een paar dieren uit bed zijn gevallen dan gaan hun naar de keuken om koekjes en melk te pakken. Dit is iets waar je met je klas op in zou kunnen gaan. Eerst zou je kunnen kijken naar welke kinderen het is opgevallen dat die beesten naar de keuken gaan en daarna zou je door kunnen gaan op wat ze daar aan het doen zijn. Het verhaal bevat veel herhaling wat heel goed is voor kleuters. Daarnaast wordt er ook getelt in het boek en ook dat is een goed element waar je verder op in zou kunnen gaan. Ga bijvoorbeeld al specifiek met die kinderen tellen, tel de knuffels, laat de kinderen hardop mee tellen. Dit is een goed boek voor kleuters die net beginnen met tellen. Ook is de boodschap dat het gezelligers is samen ook een mooi onderdeel van het boek. Het is een goed kinderboek met veel aspecten waar je dieper op in zou kunnen gaan. This book is based on the popular song with the same title. The difference is that each time an animal is named and they fall out of the bed with different sounds, making this a really good book to read to an Early Years class as they can all join in. In the end the little one is lonely and wants all the animals to come back. The book is beautifully illustrated and is a delight to read to the class! The children could also count backwards from 10 which I think is really good for practising number This book is based on the popular song with the same title. The difference is that each time an animal is named and they fall out of the bed with different sounds, making this a really good book to read to an Early Years class as they can all join in. In the end the little one is lonely and wants all the animals to come back. The book is beautifully illustrated and is a delight to read to the class! The children could also count backwards from 10 which I think is really good for practising numbers up to ten and learning about 'one less than..' e.g. "There were ten in the bed and the little one said, 'Roll over, roll over!' So they all rolled over and Hedgehog fell out... BUMP!" "There were nine in the bed...."
Also, lots of different animals fall out of bed and children will learn animal names such as Zebra, Rabbit, Mouse, and Hedgehog which I think are not featured in stories as much as dogs, cats, pigs, wolves and ducks. This book can be used in many different contexts, maths, music, drama and even literacy where children could put the animals in the order that they fall out of bed which is good for sequencing. A charming short story book based on the traditional nursery rhyme with a very clever and subtle variation. The author creates 9 stuffed animals and one little boy in a cramped bed. On each page, they all roll over and one of the stuffed animals falls out. On the last page, all the animals jump back into bed. This is a compelling sing-song cumulative countdown storybook, and it’s marvellous use of alliteration and repetitive text accompanied by the whimsical warm illustrations in soft coloured to A charming short story book based on the traditional nursery rhyme with a very clever and subtle variation. The author creates 9 stuffed animals and one little boy in a cramped bed. On each page, they all roll over and one of the stuffed animals falls out. On the last page, all the animals jump back into bed. This is a compelling sing-song cumulative countdown storybook, and it’s marvellous use of alliteration and repetitive text accompanied by the whimsical warm illustrations in soft coloured tones with contrasting and striking bold coloured toys, almost jump out the page with each countdown. 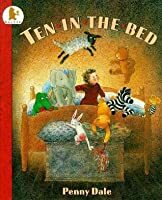 This version of 'Ten In The Bed' story is about a little boy having nine animals and one teddy sleeping in one bed. They all roll out of bed one by one and in the end the boy get's lonely and the animals and his teddy get back into bed. It is a subtle version of the nursery song Roll Over, Roll Over. This book would be good for reception and year one children as it is visually pleasing and easy to interpret what actions the characters are doing. 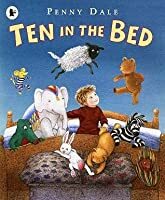 The text is also set out very much like the song i This version of 'Ten In The Bed' story is about a little boy having nine animals and one teddy sleeping in one bed. They all roll out of bed one by one and in the end the boy get's lonely and the animals and his teddy get back into bed. It is a subtle version of the nursery song Roll Over, Roll Over. This book would be good for reception and year one children as it is visually pleasing and easy to interpret what actions the characters are doing. The text is also set out very much like the song in the text, so it could be sung instead of read. I absolutely love this book and have for as long as I can remember, it always made me laugh as a child and gives me nostalgia now as an adult. While formulaic in structure, the writing in this book is simplistic yet humorous and relateable to any child who has maybe one too many stuffed animals. The drawings in this book are simple, yet perfect to go along with the story, and the personality the illustrator gave to each animal is a very nice touch to the story. I recommend this book to children I absolutely love this book and have for as long as I can remember, it always made me laugh as a child and gives me nostalgia now as an adult. While formulaic in structure, the writing in this book is simplistic yet humorous and relateable to any child who has maybe one too many stuffed animals. I LOVED this book that I inherited from my mother! It's perfect for reinforcing memorization. I really like this version of the classic rhyme/song. The illustrations are nice, and I like how different animals are used. So instead of "They all rolled over and one fell out," it's "They all rolled over and Zebra fell out," and so on. The modified ending is really cute as well, when "the little one" is cold and lonely, and all the animals jump back in the bed. So cute! I think this would be so much fun to use in a baby/toddler or preschool storytime with either puppets or flannel board animal I really like this version of the classic rhyme/song. The illustrations are nice, and I like how different animals are used. So instead of "They all rolled over and one fell out," it's "They all rolled over and Zebra fell out," and so on. The modified ending is really cute as well, when "the little one" is cold and lonely, and all the animals jump back in the bed. So cute! I think this would be so much fun to use in a baby/toddler or preschool storytime with either puppets or flannel board animals. The animals could pop out of a bag, or off the flannel board, for the kids to collect. Then when they all come back at the end, the kids could bring the animals back up! I love books that lend themselves to being interactive. There were ten in the bed and the little one said: "roll over, roll over!" A subtle variation on the traditional nursery song illustrated with wonderfully warm pictures which are crammed with amusing details. A nice bedtime story for young children to teach them about importance of sharing and friendship. Cute little book about a little boy playing with his stuffed animals. Each one of the stuff animals keep falling off the bed. Page by page you count how many were in the bed and then one falls off. The illustrations are sweet. It's not a story though I will end up reading over and over to my kid. We've always loved the rhymes, so this was delightful to read. My boys absolutely love this story. Got this out from the library and they haven’t put it down since they got. Lovely story that gets your child engaged in the story and helps his speech. In the end, the little one is lonely and all the animals jumps back into bed. This book is great fun to read with young children as each time an animal falls out, they make different sounds that children can join in with. It is also a good book for children to practice counting to 10 and for counting backwards. It can be easily supported with animal props and a toy bed to enable children with EAL to participate fully. 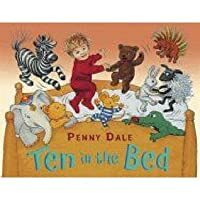 At the end of reading the story, children can sing the song 'Ten in a bed'. Delightful--would be great for bed time! I was really surprised when I started reading this to some of the children at the daycare I work at because I expected it to be a generic (albeit fun) sing-song book...but it's actually pretty entertaining for adults, too. There are all kinds of sounds that you can play around with (and teach your children onomatopoeia at the same time! ), the 'ten in the bed' including 'the little one' doubles as a good "where's..." game, and the animals are creative (por Delightful--would be great for bed time! I was really surprised when I started reading this to some of the children at the daycare I work at because I expected it to be a generic (albeit fun) sing-song book...but it's actually pretty entertaining for adults, too. There are all kinds of sounds that you can play around with (and teach your children onomatopoeia at the same time! ), the 'ten in the bed' including 'the little one' doubles as a good "where's..." game, and the animals are creative (porcupine, crocodile, teddy bear). Plus, the artwork is really quite good. This book involves one little child, nine nursery animals, an enormous bed. With ten in the bed, it's a bit of a squeeze! Roll over, roll over! But the little one gets cold all alone, and soon all ten are snuggled up and fast asleep. This bedtime rhyme is for perfect for young children. However I used this story with an SEN class, and they thoroughly enjoyed signing along, and were all kept actively engaged whilst the story was read. This book is a great read. It is very predictable. Each time someone falls out of the bed there is a different sound that is made. For some this is the best part. This is also a song, if you like you could sing the book the children and they would love that. I have read this book many times and who ever I read it too always likes to sing along. I would recommend this book to younger children. They would have more fun with the song. A young boy goes to sleep with ten of his closest friends--his stuffed animals. As he settles in for the night he tells them to roll over to create more room. One by one his friends fall to the floor and at last the little boy is alone in his bed... but now he is lonley. This is a quick read for kids and is great for bedtime. 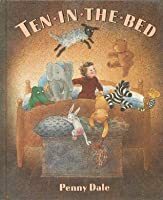 Far from being my favorite, "Ten in the Bed" is a book about a young toddler who slept with his ten of his stuffed animals in his bed and ended up rolling them all out of the bed until only he was left. Although this book would be okay for a child who is trying to learn to count, I wouldn't recommend it. I remember my mother reading this book to my little brother and me when we were very little. For whatever reason this book as stayed in my memory since way back then. 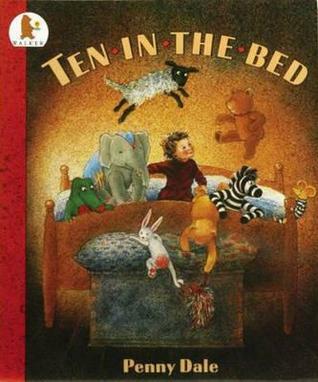 It reads to the tune of "Ten in the Bed" with a little boy asking his stuffed animals to roll over onto the ground. Very fun book and would be great for a kindergarten classroom. Penny Dale was born in Abbey Road near The Beatles' Studio, but grew up in Ottery St Mary. Her first school was so small that all the children were in one classroom, and even that wasn't full. She drew and made things all the time and her dad showed her how to use a hammer properly, something she's still proud of. She made plasticine models of everything she could think of. When Penny was very sma Penny Dale was born in Abbey Road near The Beatles' Studio, but grew up in Ottery St Mary. Her first school was so small that all the children were in one classroom, and even that wasn't full. She drew and made things all the time and her dad showed her how to use a hammer properly, something she's still proud of. She made plasticine models of everything she could think of. When Penny was very small, she found her parents' folios from a time when they both went to life drawing classes in London. She remembers being immensely impressed by their drawing, and even though she was very young, she knew she wanted to draw like that one day. At her junior school she was encouraged to draw pictures to complement written work, and this she loved, though this was not encouraged later on at secondary school, which she found disappointing. However, she still managed to illustrate work in some subjects, like Science (lively diagrams), Geography (coloured-in maps) and even made a lift-the-flap Norman Castle in History. After secondary school, Penny took a Foundation Course at Bristol, then took a gap year to work with the Arts Workshop in Bath, making props and costumes, acting, and counting the takings on foreign tours. Later she did a Fine Art Degree at Exeter, where she met her husband Bryan. After college she began working for a time at the Northcott Theatre, designing and making costumes and props again, before she and her husband moved to Northumberland to work on renewable energy projects and graphic design. Their daughter Sarah was born in Hexham, and a friendship developed with an artist she met at childbirth classes, which led to shared daughter-minding, making time for painting, drawing and print making. A year later Penny moved down to South Wales, where Bryan took up a lecturing post in design. It was there that she started to write and illustrate children's books. Today Penny is one of the UK's leading illustrators of children's books. Her books have met with great success: BET YOU CAN'T and ONCE THERE WERE GIANTS were included in the UK SATS booklist for many years. WAKE UP MR B! was commended for the Kate Greenaway Medal 1988. ROSIE'S BABIES (written by Martin Waddell) won the Best Book for Babies award and was also shortlisted for the Kate Greenaway Medal in 1990. NIGHT NIGHT CUDDLY BEAR (also written by Martin Waddell) and TEN IN THE BED both won the Oppenheim Toy Portfolio Award in 2001 and 2002 respectively. JAMIE AND ANGUS (written by Anne Fine) won the BOSTON GLOBE-HORN BOOK Award in 2003. Penny has sold over three million books worldwide and has been published in over twenty languages. Her most recent work includes PRINCESS, PRINCESS, as well as THE BOY ON THE BUS and JAMIE AND ANGUS TOGETHER.